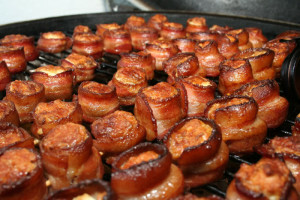 These Cheese Stuffed Hog Shots (also known as pig shots) are easy and delicious. How can you go wrong with pork sausage wrapped in bacon? Check to ensure your hopper is filled with pellets (we recommend fruitwood blend). Start the grill at 325°F. Cut the sausage so it’s 2/3 the width of the bacon. The idea is to create a mixture that can then be piped into the space left by the sausage being wrapped in bacon with a little space at the top. Cut the bacon strips in half. Take one sausage slice and wrap the sausage with one slice of bacon using a toothpick to hold it together. One trick, make sure the bacon stays cold, it’s easier to wrap that way. Make sure to place the sausage low on the bacon (even with the bottom edge) so that when you wrap it, there will be space for filling at the top. Repeat until all sausage is wrapped in bacon. Make sure the cream cheese is at room temp, mix in the cheese and the chilies. Place the mixture in a quart size Ziploc bag. Cut off one corner of the bag so that you can squeeze the bag. Use it to fill the Hog Shots with enough filling to just go above the top of the bacon as it will reduce down as it cooks. Cook until the bacon is done to your preference, but typically around 60 minutes. Tip: Use a Cookshack Seafood Grill to ensure you do not lose any Hog Shots between the grates! You can also use skewers as a way to keep your Hog Shots from falling.